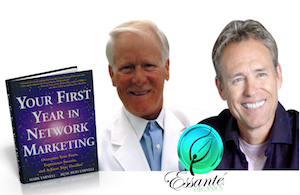 Hear Mark Yarnell, Author of Your 1st Year In Network Marketing, in a candid interview with Essanté Organics CEO. Mr. Yarnell shares where he found unlimited targeted leads & how you can do the same thing. How did he build rapport with them? What script did he use to build his 30 million dollar networking empire (pre-internet)? What mistakes do networkers make? What’s the main difference between amateurs & professionals? And why did Mark laugh at Donald Trump? Discover ALL the answers in the FULL FASCINATING INTERVIEW below…. See The 12 Questions We Ask Mark!